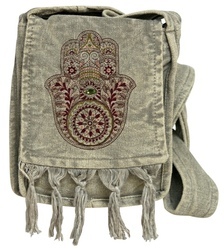 Make sure to ward off any evil or negative vibes when traveling around with this Hamsa hand passport bag. Revered by many cultures for centuries as being a relic of protection, the hamsa hand will be sure to protect you in any corner of the globe that you may travel. This bag features a bejeweled eye in the center of the hand and a fringe flap over a zip closure. This bag measures approximately 7" x 8" and has a cross body length strap approximately 48" long.